I was watching “What Would Brian Boitano Make?” on the Food Network this afternoon and I just had to try the panzanella salad that he made. The recipe looked really simple but delicious. It turns out that it really was DELICIOUS. I served it with shrimp cooked in the same mixture that the bread is tossed in (I made a second batch of the butter/garlic/oil mix while the bread was toasting in the oven.) I used regular olives because that’s what I had in the house. I also used Apple Cider vinegar for the same reason. In a small skillet over medium-low heat, add 3 tablespoons olive oil, the butter, garlic, red pepper flakes, and salt and pepper, to taste. Cook to infuse the butter and oil with the garlic, about 4 minutes. Add the cubed bread to a large bowl, pour the butter and garlic mixture over the bread and toss to coat. Transfer to a sheet tray and bake until crisp, about 10 minutes. Remove from the oven and let cool. In a small bowl whisk together the remaining olive oil and red wine vinegar and set aside. 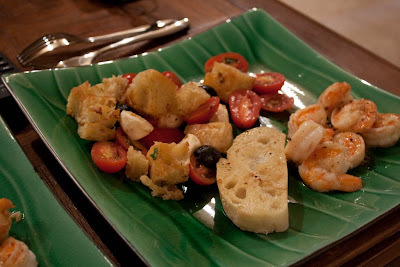 In a large serving bowl, combine the tomatoes, olives, mozzarella, croutons, basil, and the oil and vinegar mixture. Gently toss to coat all the tomatoes and croutons. Let the salad sit for 10 minutes before serving. At first I thought the show was going to be lame but he is just so adorable! It is one of those shows that I will just HAVE to see on the weekends now. Incredible! Posted by galadriel07 on September 12, 2009 in General Food, Meals! In a large saucepan heat 2 quarts of lightly salted water to a boil. While waiting for the water to come to a boil, combine the pork and 2 tablespoons of the soy sauce in a small bowl and mix well. Add the oil to a wok or saute pan and heat over medium high heat until very hot. Add the pork and stir-fry, stirring with a spatula to break it into small pieces. When the pork is crispy and dry, about 5 minutes, remove it with a slotted spoon and transfer to a paper-lined plate to drain. Pour off most of the oil, leaving 2 tablespoons in the wok. Reheat the wok, add the garlic, ginger, and scallions, and stir-fry for 30 seconds. Add the sesame paste, remaining 2 tablespoons of soy sauce, chili oil, chicken stock, and ground peppercorns or chile paste and simmer for 4 minutes. When the water has come to a boil, cook the noodles until al dente, for 2 minutes if they are fresh or 5 minutes if they are dried. Drain the noodles and add to the reduced sauce in the wok, along with the reserved pork, and toss until thoroughly combined and coated with the sauce. Top with the matchstick radishes and serve immediately. Copyright © 2006 Television Food Network, G.P., All Rights Reserved. Halve the unpeeled cucumber lengthwise. Scrape out the seeds and cut the cucumber into chunks. Mix the cucumbers with the sugar, vinegar, and chili oil. Sprinkle with the sesame oil just before serving. 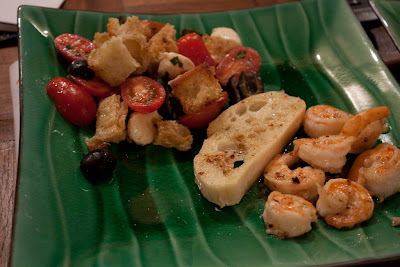 Posted by galadriel07 on August 31, 2008 in General Food, Meals! Well, since I cannot be at home cooking, I have decided that I should have my equipment there when I arrive. I want to start making bread and Bean recommended an enameled dutch oven by Lodge so I ordered that from amazon along with a cast iron skillet and 2 new Alton Brown books. I brought the first Alton Brown books with me to the hotel this time so I am in the middle of that. When I get home, both the new books will be there for me to read. I am excited about making bread and searing meats in my new skillet. I have not been cooking much. I have been getting microwaveable vegetables for my dinners to offset the fast food that I eat during the day, although lately we have been eating pretty good for us foods instead of fast foods. There is a whole section on microwave foods in this first Alton Brown book so I am hoping it will give me some ideas on that.